Are you a business owner that orders blank address labels in bulk? If you are then Burris Computer Forms is the right place for you. Our Blank Print-Your-Own Labels™ are a high quality label that allows you to print out as many addresses as you need. As a business owner who does a lot of shipping you know that as the holidays approach you will get busier and busier. At Burris Computer Forms we want to make sure that you have the tools in place that will help make your busy seasons much easier. There are several reasons our blank address labels are so great, but below are just a few reasons they will help your business. Since you print your own labels you can customize the message on any label. The labels that you use can and will be used in a variety of applications, each one that our labels will be perfect for. You do not have to throw away the labels you do not use, since you can print the exact number of labels you need. Since the labels are blank and the design has already been created you can skip the proofs and design teams. Because of the business processes that can be avoided you are able to save your business a lot of time and money during the printing process. The standard uncoated blank labels from Burris Computer Forms can be used with inkjet or laser printers. Another major benefit to the blank address labels that you will find at Burris Computer Forms is the different colors of labels available. 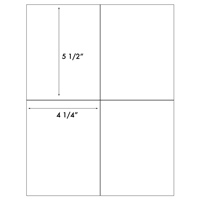 Our Blank Print-Your-Own Labels™ come in white as well as regular and pastel colors. We also have labels that come in green, red, pink, orange, and yellow fluorescents. All the color labels are permanent uncoated labels. Visit our website, www.pcforms.com today and see the variety of blank address labels that you can customize to meet your business needs. These will allow you to alter your messages, font, and design as you get deeper into the holiday season. They also assure that the left over labels you have after the holiday season can still be used since they are blank and you only have to print them as needed.